Size: * 3-6 mos. 6-12 mos. Now even the newest little one can show off their home state pride with this darling Born design from Home State Apparel! Parents can now ooh! and aah! at their little bundle of joy as they spit up all sorts of disgusting stuff on their new, superbly stylish, home lap shoulder creeper. 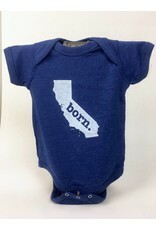 These are hand silkscreened 60/40 blend Bodysuits with the original, ever so popular distressed "born." logo screen-printed on the front for a soft vintage feel. They are the PERFECT item to bring to a baby shower! Available in 3-6 months and 6-12 months sizes. Look for "home" toddler t's for big brother or sister!